Several optic disc disorders and numerous conditions can simulate optic disc edema or swelling. It can be due to pathology of optic nerve itself or brain. To distinguish the different causes of optic disc edema, the following three things are required – (i) a meticulous history taking, (ii) fundus examination, and (iii) investigations. The first issue in the diagnosis that comes in the way is whether it is a true disc edema or congenital abnormality of disc or optic nerve head drusen (ONHD) or hyperopic disc. Finally, after determining that it is true disc edema, i.e., papilledema, the next dilemma arises whether it is due to increased intracranial tension or another cause of optic disc swelling. Diagnosing early optic disc edema and identifying the cause behind it is very important to halt the disease progression. Sometimes, disc edema diagnosis is the basis of taking major decisions like in cases of malignant hypertension in pregnancy. 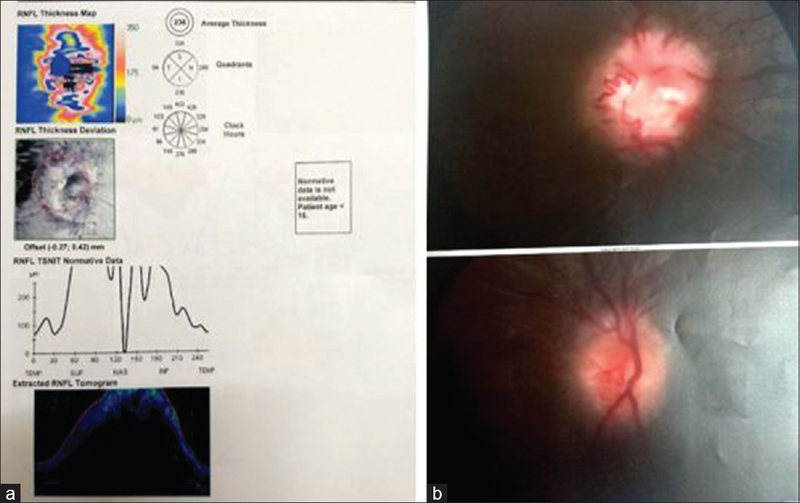 Several investigations including fundus photographs, fundus fluorescein angiography (FFA), and optical coherence tomography (OCT) are frequently done to find out disc swelling and quantify it. It will be easy if we can confirm disc edema and diagnose the cause of edema with a simple noninvasive technique. In recent years, OCT as an investigation is chosen to find out whether it can help to differentiate between various causes of disc edema and can help in the early diagnosis and classification of disc edema. OCT is a tool which can be used to quantify disc edema based on retinal nerve fiber layer (RNFL) thickness, which is found to be increased in disc edema. It is a noninvasive, noncontact testing tool often used to evaluate optic nerve, retina, and macular pathologies. OCT is based on the principle of low-coherence interferometry and provides cross-sectional images of the required area. OCT is broadly of the following two types – (a) time domain or (b) frequency domain. Frequency domain is further classified into spectral domain-OCT (SD-OCT) and swept domain. The difference between time domain-OCT and SD-OCT is that the former uses time delay data to determine spatial location of the reflected diet and the latter uses light frequency. SD-OCT utilizes Fourier transformation of the reflected light to encode distance between different structures. The majority of OCT machine uses SD technology. OCT can track small changes in tissue structure along the course of disease. This unique feature together with clinical findings can further focus on slab within the region of interest. SD-OCT in optic nerve evaluation can provide important diagnostic information in various causes of optic disc edema and central nervous system pathologies. The pathophysiology of optic disc edema varies according to the cause. There are many ways to classify disc edema causes according to literature. Some classify it as papilledema; pseudopapilledema; and optic neuropathies due to ischemia, hereditary, nutritional, or toxic, while it is also classified according to unilateral or bilateral involvement or common and uncommon causes. In case of papilledema, swelling of the optic disc is due to increased intracranial tension like in idiopathic intracranial hypertension (IIH) or pseudotumor cerebri, space-occupying lesion, and malignant hypertension. The term pseudopapilledema is used to describe optic nerve abnormalities that mimic papilledema on disc examination such as ONHD, Bergmeister's papilla, crowded hyperopic disc, congenital anomalies, and myelinated nerve fiber layer. Optic neuropathies such as anterior ischemic optic neuropathy (AION), papillitis, Leber's hereditary optic neuropathy, diabetic papillopathy, and central retinal vein occlusions (CRVOs) are the other causes of disc edema. It is a clinical entity of unknown cause characterized by increased intracranial pressure (ICP). Patients are almost uniformly young, obese female of childbearing age.,, The diagnosis is done on the basis of modified Dandy criteria, neuroimaging which excludes a mass lesion or hydrocephalus or venous thrombosis, and with normal cerebrospinal fluid composition. In 1860, von Gräfe found out papilledema as the result of axoplasmic flow status within intra-axonal edema in the area of optic nerve disc. As cerebrospinal fluid pressure rises the pressure transmitted to the optic nerve sheath, it acts as a tourniquet to decrease axoplasmic transport, resulting in disc edema. Clinical features of increased ICP such as headache, nausea, blurring of vision, photophobia, eye pain, diplopia, pulsatile tinnitus, and sixth-nerve paresis are present, and visual loss is insidious. On direct and indirect ophthalmoscopy disc hyperemia, blurring of disc margins, edema of RNFL, and absence of spontaneous venous pulsation confirm the diagnosis, but the presence of spontaneous venous pulsation does not rule out papilledema. Nearly 80% of patients have spontaneous venous pulsation, and it is generally absent when ICP rises above 200 mmH2O. Papilledema is a leading sign in IIH, but can be asymmetric in both eyes and staged based on Frisen scale. OCT shows increased RNFL thickness in all quadrants, most commonly in the inferior quadrant. Eyes with optic disc edema have statistically significant increase in RNFL in all the four quadrants as compared to normal individuals. It mainly occurs in an adult and less commonly in a child. Systemic arterial blood pressure is in the range of 250/120 mmHg or higher. Malignant hypertension leads to the breakdown of blood–retinal barrier. Resultant fundus findings are due to local optic nerve ischemia, disrupted axonal transport, or hypertensive encephalopathy, leading to ICP. It is also associated with choroidopathy and retinopathy due to choriocapillary occlusion and vascular abnormalities. Clinical features involve good visual function initially with generalized cerebral dysfunction like confusion and cerebral edema with bilateral optic disc edema. Fundus finding shows cotton wool spots, flame-shaped hemorrhages, hard exudates, substantial retinal arteriole narrowing, and bilateral obscuring of disc margins and disc elevation. OCT shows RNFL edema [Figure 1]a and [Figure 1]b. Optic nerve glioma occurs in less than 15 years and leads to fusiform enlargement of the optic nerve. About 25% of gliomas appear in patients with neurofibromatosis type 1. On the other hand, optic nerve sheath meningioma occurs in middle-aged adults, women more than men, and shows nonspecific enlargement of the optic nerve. Intracranial mass lesions such as cerebral neoplasm and gliomatosis cerebri can mimic IIH. One way is compression of the optic nerve by tumor-causing optic disc swelling and the other is increased ICP due to edema. In case of optic nerve tumors, patients present with exophthalmos, painless vision impairment, strabismus, and presence of relative afferent pupillary defect. Space-occupying tumors have similar presentation like IIH. In patients with papilledema due to optic sheath meningioma, on OCT, the peripapillary retinal pigment epithelium around the neural canal was found to be U shaped indented, whereas normally, it is V shaped, pointing away from the vitreous., [Figure 2]a and [Figure 2]b shows OCT and fundus photos of patient with right eye hamartoma. It causes sudden loss of vision due to disrupted blood flow in a disc. It is believed to be secondary to decreased blood flow to disc with retinal nerve fiber crowding or because of vasculitis. This condition is also associated with axonal swelling axoplasmic flow stasis in optic nerve head such as papilledema due to ICP. Clinical features comprise sudden, painful diminished vision typically occurring unilaterally. Fundus finding includes disc swelling, blurred disc margins, and hemorrhages around the optic nerve head. Disc swelling is sectoral in and associated with capillary dilatation with splinter hemorrhage. Disc edema is less marked than in cases of papilledema. Over time, disc edema decreases which leads to progressive optic atrophy and pallor. Resolution of disc edema will be faster in patients with more severe vision loss due to more axonal destruction, which results in few axons to swell up and cause edema. OCT at presentation shows increased RNFL thickness compared to fellow eye, which can be nearly doubled [Figure 3]. Once disc edema decreases, RNFL thickness comes down corresponding to progressive optic atrophy. Contreras et al. studied that OCT-measured RNFL thickness increased to 96.4% in affected eye compared to fellow eye. After 2 months of events, RNFL was similar to fellow eye followed by reduction to 40% in 4 months and stabilization in 12 weeks. Therefore, OCT can measure optic disc edema and monitor RNFL loss over time. Again, in 2014, Kupersmith found that, in 5 weeks, only 10% of eyes with nonischemic optic neuropathy had RNFL loss, whereas 76% had ganglion cell layer complex thinning. Hence, ganglion cell layer could be a biomarker for AION. Bellusci et al. in 2008 reported that eyes with visual defects in inferior hemifield had RNFL involvement to the superior, temporal, and nasal quadrants of optic disc. Patients with inflammatory optic neuropathy have papillitis, a nerve inflammation secondary to demyelination, inflammation of the meninges, sinusitis, and orbital soft-tissue inflammation. It typically affects young females more than males. This is characterized by acute inflammation of the optic nerve with loss of axons. Clinical features include sudden visual loss, pain, reduced color vision mainly for green and red and depth of perception, flashes of light, and visual-field defects. Visual loss is rapid in onset over hours to few days. Typically, pain precedes the diminished vision by 5–6 days. Pain is present initially with eye movement or is aggravated on eye movement with globe tenderness. Visual-field defects consist of altitudinal defects and central or centrocecal scotoma. Atypical features such as bilateral eye involvement, no perception of light, disc hemorrhage, severe disc edema, and absence of pain and macular star or macular exudates suggest alternate diagnosis of optic nerve compression, syphilis, lupus nutritional, or Leber's hereditary optic neuropathy. Fundus examination shows one-third of patients with mild optic nerve head edema, generally much less marked than disc edema in papilledema [Figure 4]. It is less sectoral and not associated with capillary dilatation and splinter hemorrhage, which are typical characteristics of AION. OCT shows increased RNFL thickness at presentation followed by progressively thinning of RNFL. Hence, OCT helps in knowing the time elapsed between the onset of disease and diagnosis. These are considered to be calcium deposits within the optic nerve head in crowded disc with abnormal vessels. They become more noticeable by the end of the first decade of life. Fundus findings show elevated optic nerve head, giving the disc translucent appearance with disc drusen highlighted. Sometimes, they appear like tapioca bodies. They are usually associated with an anomalous retinal artery branching pattern. Peripapillary subretinal hemorrhages are most typical of disc drusen. Red-free fluorescein filter shows autofluorescence with numerous round lesions when photographed without dye injection. Diagnosis is confirmed by combined amplitude scan and brightness scan. Lee et al. confirmed in their study that nasal RNFL thickness is a differential marker for optic disc edema from ONHD. OCT is an easy investigation to give information about the location and size of disc drusen within the optic disc. OCT shows significant increase in mean RNFL thickness along with triangular-shaped hyporeflective subretinal space [Figure 5]. ONHD tends to have elevated optic nerve head with a lumpy-bumpy appearance of internal optic nerve contour in contrast to papilledema, which has smooth internal contour [Figure 5]a and [Figure 5]b. The presence or absence of RNFL thinning or thickening alone does not help clinicians to distinguish between ONHD and optic disc edema, but nasal quadrant RNFL thickness is a good differential marker. Retinal cells lack oligodendrocytes, so they are unmyelinated. Myelinated nerve fibers are white patches of myelin typically within RNFL. These are static, and it is important to recognize these benign lesions when found incidentally as they cause pseudopapilledema. Fundus findings with high-magnification edges appear serrated or feathery as the myelination along nerve fibers. It occurs usually in type 1 diabetic patients or juvenile onset, also called insulin-dependent diabetic patients. Onset is usually between the ages of 20 and 40 years. Although the disorder may also occur in type 2 diabetes, it is important to distinguish it from papilledema [Figure 6]a and [Figure 6]b.
Pathophysiology is understood poorly, but mostly it is the disruption of blood supply to optic nerve, which is a cause of disc edema and interferes with axoplasmic transport. Clinical symptoms of impaired vision are generally absent or minimal, and visual acuity is good. Visual field shows enlargement of blind spots. Diabetic papillopathy can be found incidentally on routine evaluation. Fundus finding shows bilateral disc edema with typical prominent telangiectatic vascular dilatation. Nakamura et al. in their study described cases of serous macular detachment identified on OCT imaging in cases of diabetic papillopathy with minimal or no concurrent diabetic retinopathy. On FFA in these cases, they too concluded that the fluid resulted due to leakage from the optic nerve head rather than a disruption of the blood–retinal barrier. CRVO may also be associated with systemic hypertension, hypercoagulability, and connective-tissue disorders. It can be classified into ischemic and nonischemic. Patients with ischemic CRVO mostly have poor vision. The pathophysiology of CRVO is believed to be thrombosis of the central retinal vein. Lipoprotein levels were found to be elevated in CRVO. Clinical features involve acute or subacute loss of vision, which is painless and associated with photopsia. Fundus finding shows tortuosity and dilatation of retinal veins, optic disc edema, cotton wool spots, and retinal hemorrhages. OCT shows increased retinal thickness due to the formation of cystoid structure at the level of inner nerve layer of foveal region. 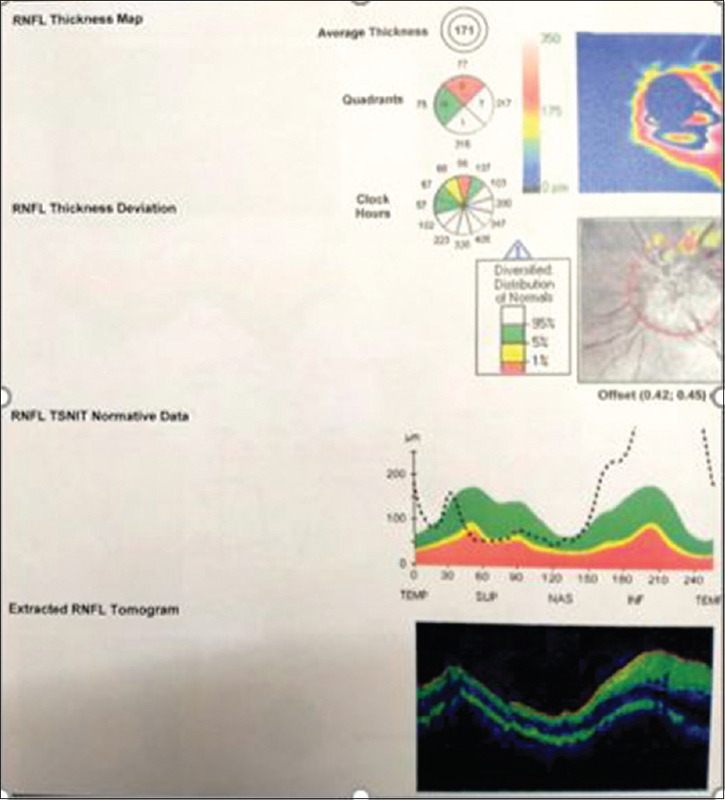 OCT is useful for the evaluation of treatment success and monitoring macular edema. OCT has improved our understanding of pathophysiology of various causes of disc edema. Studies done by von Gräfe, Paton and Holmes, and Fry on the pathology of papilledema tell about how increased ICP within the optic nerve sheath can lead to central retinal vein obstruction.,, Hedges in his correlative study showed that increase in ICP is always associated with a rise in ophthalmic vein pressure. In 1977, Tso and Hayreh found out that the primary pathology in papilledema is a severe swelling of axons leading to disruption of the mitochondria and neurotubules. Morris and Sanders shortly after discovered that visual acuity loss in papilledema is due to macular changes. In a study done by Martinez et al. in young patients (under 20 years of age), peripapillary RNFL thickness was more in papilledema cases than that in pseudopapilledema cases. According to the authors, it was a reliable tool to differentiate between the two. Mean RNFL in this study came out to be 218% more as compared to RNFL of the eyes with pseudopapilledema. After this, differentiating moderate or severe papilledema from pseudopapilledema became easy, but diagnosing and differentiating early papilledema is still challenging. Karam and Hedges in a study conducted in 2005 showed that mean RNFL values in both mild papilledema and pseudopapilledema were higher than that of normal controls, which were significant. Although there was difference between mean RNFL in papilledema and pseudopapilledema, it was not statistically significant. Hence, they concluded that OCT analysis alone is not capable of differentiating between similar appearing entities. Kamal Elshafei et al. compared 16 patients with optic disc edema and 11 normal controls in their study. They concluded that there was a statistically significant increase in mean RNFL thickness and maximum neurosensory retinal (MNSR) thickness in all the four quadrants in all grades of optic disc edema group compared with that of the control group. Here, MNSR is the highest point of retinal elevation to the upper surface of retinal pigment epithelium. Menke et al. selected 13 patients in their study with previously diagnosed disc edema caused by either optic neuropathy or CRVO and 13 healthy age-matched controls and finally arrived at a conclusion that the presence of a significant difference within the averaged RNFL % values in optic neuropathy group and the absence of such a difference in retinal vein occlusion group should be explained by edema primarily affecting the RNFL in optic neuropathy, in contrast to what occurs in retinal vein occlusion, where edema affects all the retinal layers. OCT can objectively quantify the amount of RNFL swelling and axonal swelling, which is found to be the main pathological event in disc edema. OCT, being a noninvasive investigation, can be used as a tool in following the clinical course of optic nerve disc edema, monitoring the resolution of axonal swelling and thinning of RNFL. It can follow the evolution of initial thickening and progressing thinning in cases of AION. Friedman DI, Jacobson DM. Diagnostic criteria for idiopathic intracranial hypertension. Neurology 2002;59:1492-5. Kesler A, Hadayer A, Goldhammer Y, Almog Y, Korczyn AD. Idiopathic intracranial hypertension: Risk of recurrences. Neurology 2004;63:1737-9. Wall M. Idiopathic intracranial hypertension. Neurol Clin 2010;28:593-617. Von Graefe A. Engorgement and distention of retinal as an early manifestation of papiledema. Arch F Ophthalmol 1860;7:58-71. Kaufhold F, Kadas EM, Schmidt C, Kunte H, Hoffmann J, Zimmermann H, et al. Optic nerve head quantification in idiopathic intracranial hypertension by spectral domain OCT. PLoS One 2012;7:e36965. Karam EZ, Hedges TR. Optical coherence tomography of the retinal nerve fibre layer in mild papilloedema and pseudopapilloedema. Br J Ophthalmol 2005;89:294-8. Sibony P, Kupersmith MJ, Rohlf FJ. Shape analysis of the peripapillary RPE layer in papilledema and ischemic optic neuropathy. Invest Ophthalmol Vis Sci 2011;52:7987-95. Contreras I, Rebolleda G, Noval S, Muñoz-Negrete FJ. Optic disc evaluation by optical coherence tomography in nonarteritic anterior ischemic optic neuropathy. Invest Ophthalmol Vis Sci 2007;48:4087-92. Contreras I, Noval S, Rebolleda G, Muñoz-Negrete FJ. 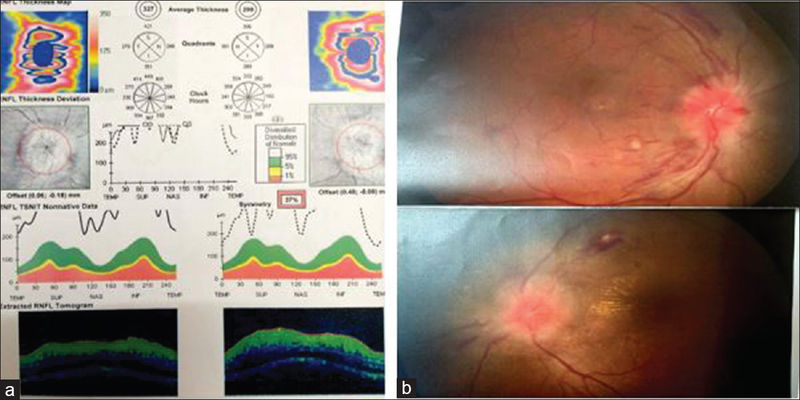 Follow-up of nonarteritic anterior ischemic optic neuropathy with optical coherence tomography. Ophthalmology 2007;114:2338-44. Kupersmith MJ, Sibony P, Mandel G, Durbin M, Kardon RH. Optical coherence tomography of the swollen optic nerve head: Deformation of the peripapillary retinal pigment epithelium layer in papilledema. Invest Ophthalmol Vis Sci 2011;52:6558-64. Bellusci C, Savini G, Carbonelli M, Carelli V, Sadun AA, Barboni P, et al. Retinal nerve fiber layer thickness in nonarteritic anterior ischemic optic neuropathy: OCT characterization of the acute and resolving phases. Graefes Arch Clin Exp Ophthalmol 2008;246:641-7. Rebolleda G, de Dompablo E, Muñoz-Negrete FJ. Ganglion cell layer analysis unmasks axonal loss in anterior optic neuritis. J Neuroophthalmol 2015;35:165-7. Auw-Haedrich C, Staubach F, Witschel H. Optic disk drusen. Surv Ophthalmol 2002;47:515-32. Lam BL, Morais CG Jr., Pasol J. Drusen of the optic disc. Curr Neurol Neurosci Rep 2008;8:404-8. Lee KM, Woo SJ, Hwang JM. Differentiation of optic nerve head drusen and optic disc edema with spectral-domain optical coherence tomography. Ophthalmology 2011;118:971-7. Salvatore S, Iannetti L, Fragiotta S, Vingolo EM. Optical coherence tomography and myelinated retinal nerve fibers: Anatomical description and comparison between time-domain and spectral domain OCT. Minerva Oftalmol 2011;53:31-8. Nourinia R, Behdad B, Montahaei T. Optical coherence tomography findings in a patient with myelinated retinal nerve fiber layer. J Ophthalmic Vis Res 2013;8:280-1. Nakamura M, Kanamori A, Nagai-Kusuhara A, Kusuhara S, Yamada Y, Negi A, et al. 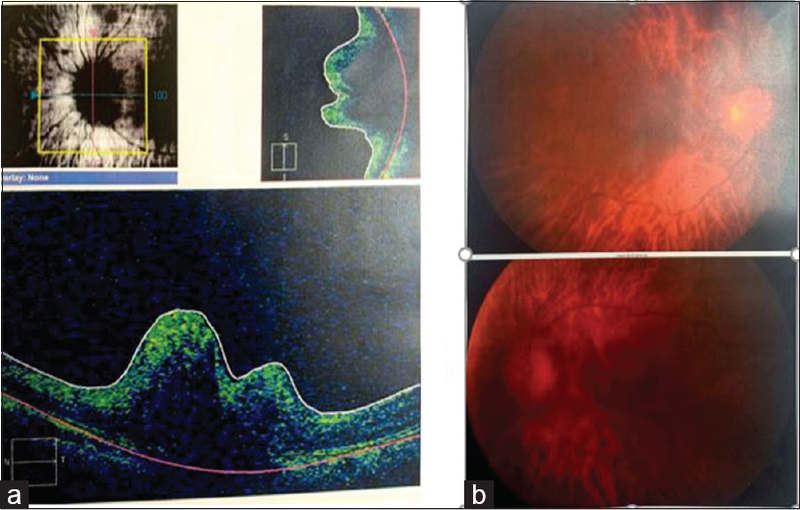 Serous macular detachment due to diabetic papillopathy detected using optical coherence tomography. Arch Ophthalmol 2009;127:105-7. Paton L, Holmes G. The pathology of papilledema. Brain 1911;33:289-432. Fry WE. The pathology of papilledema. Am J Ophthalmol 1931;14:874-83. Hedges TR. A correlative study of orbital vascular and intracranial pressure in the rhesus monkey. Trans Am Ophthalmol Soc 1963;61:589-637. Morris AT, Sanders MD. Macular changes resulting from papilloedema. Br J Ophthalmol 1980;64:211-6. 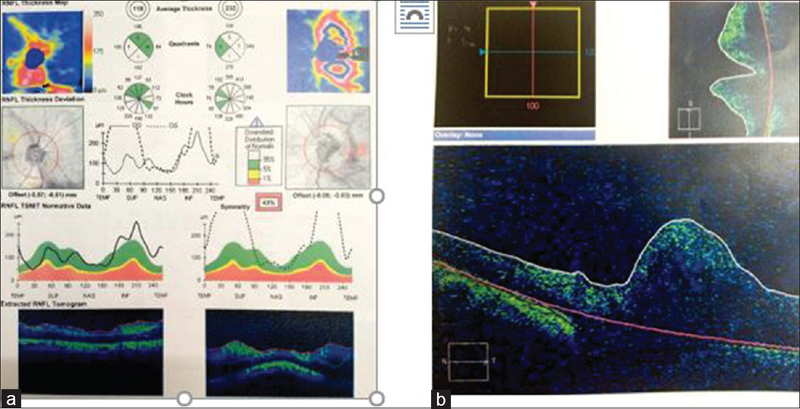 Martinez MR, Ophir A. Optical coherence tomography as an adjunctive tool for diagnosing papilledema in young patients. J Pediatr Ophthalmol Strabismus 2011;48:174-81. Kamal Elshafei AM, Abdelrahman RM, Atta Allah HR. 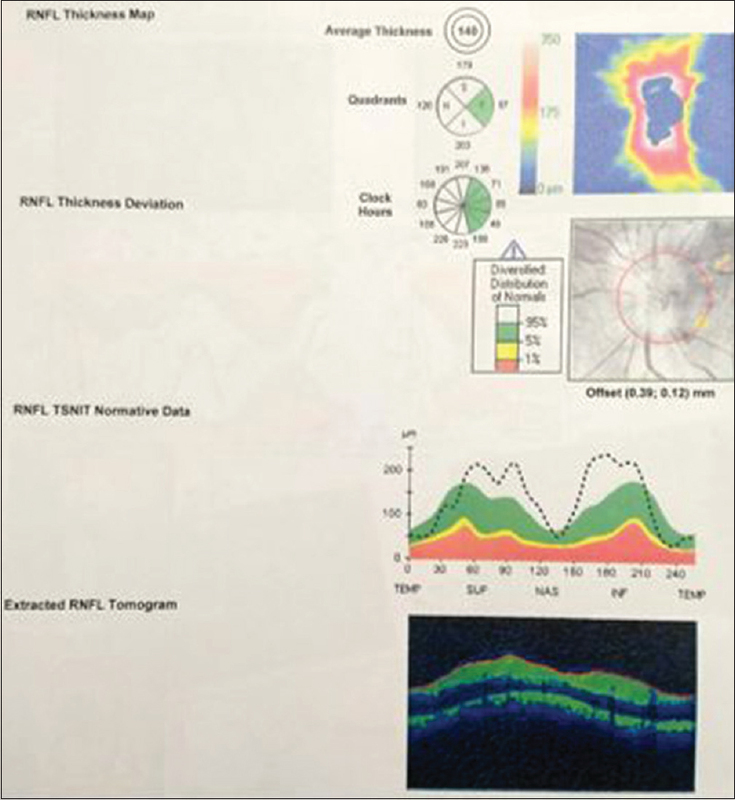 Quantitative assessment of optic disc edema using spectral domain coherence tomography. J Egypt Ophthalmol Soc 2014;107:49-54. Menke MN, Feke GT, Trempe CL. OCT measurements in patients with optic disc edema. Invest Ophthalmol Vis Sci 2005;46:3807-11.